Advanced Accounting is a new Canadian textbook that offers students clear explanations of accounting standards, unique content, and challenging problems and cases. Taking a very detailed approach to the topics that can be difficult for students to master; the text lays out each topic very clearly and provides illustrative examples that show students how these concepts are applied. This helps students understand the reasons that adjustments are being made, which leads to a deeper understanding of the concepts and avoids the pitfalls that come from simply memorizing formulas. The chapters are also outlined by learning objectives so that instructors can decide the level of depth they wish to cover. Advanced Accounting is designed to address those advanced topics in accounting that require knowledge of all other sections of the CICA Handbook. 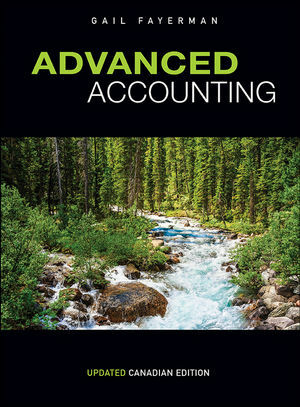 This text builds on the knowledge obtained in an intermediate accounting course and is intended to extend the learning from intermediate texts such as Intermediate Accounting by Kieso, Weygandt, Warfield, Young, and Wiecek. Chapter-opening stories: At the beginning of each chapter, are real-life stories which illustrate the concepts students will examine in the chapter. Illustrative examples: Every major topic is followed up with at least one illustrative example to reinforce the material. ASPE boxes: These boxes highlight all areas where the standards are different from IFRS. Learning check boxes: Each learning objective is summarized in a learning check box to reinforce the concept that has just been examined. Demonstration problems: The end of each chapter (with the exception of Chapter 1) has at least one comprehensive problem that incorporates all the learning objectives in the chapter. End-of-chapter material: At the end of each chapter are different types of problems intended to reinforce various aspects of learning.